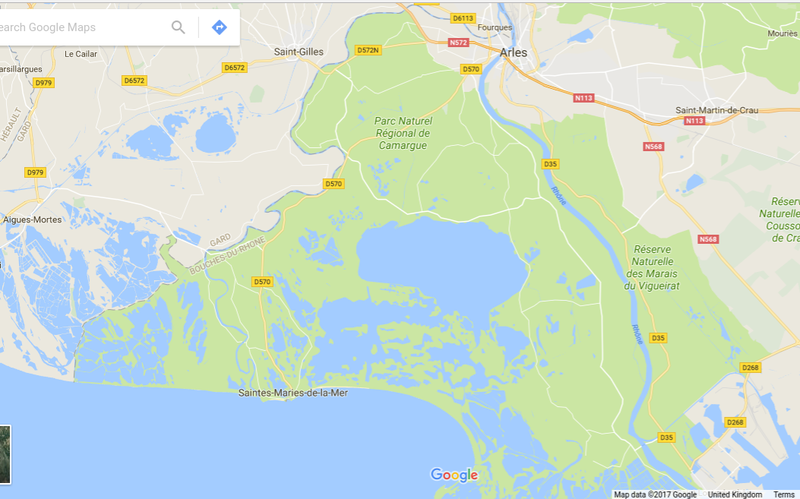 Well, as planned, on Saturday we landed on a sea front Aire very near to the town of Saintes-Maries-de-la-Mar which is the capital of the Camargue region. It costs 13 euros a night, but it's position right by the ocean makes it worth every penny, and it's also very conveniently situated for a couple of outings on our bikes. 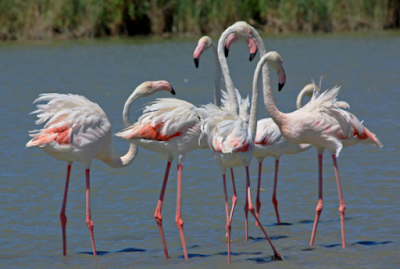 The Camargue itself lies between the two arms of the Rhone River delta - the eastern arm being the Grand Rhone, and the western one is the Petite Rhone (but there was nothing little about it), and inbetween is an area of marshland, salt-flats, lagoons and dunes, much of which has been designated a UNESCO biosphere reserve. When we arrived the day was wearing on, but so that we could make the most of our time here we went for a walk along the lovely promenade that is just in front of our van. This led us along the sea front and into the town were we visited their Tourist Info Office to find out more about the cycle routes which we already knew were available. It was also here that we found the towns bull ring - it looked as if some event was impending because there was a queue at the box office! Apparently, in the Camargue they don't kill the bulls - they just attach ribbons and rosettes between their horns and it's the bull fighters job to retrieve them, but I'd be fairly sure the poor animal would be quite tormented, and watching definitely wouldn't be our cup of tea so we passed on by! Then we had a little mosey around the shops that sold all manner or goods that are produced in this area, but in the hot sun and heaving crowds this didn't really suit us either, so in the end we strolled home, put our feet up and watched the world go by! Sunday morning saw us up and out on our bikes for a 30 mile tour to explore the marshes and lagoons, and we'd only just tootled up the trail when we were literally stopped in our tracks by the sight of literally thousands of beautiful pink flamingo's feeding in the shallow waters of Etang de l'Imperial. 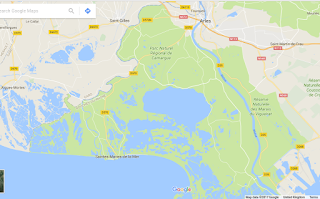 Apparently, since the 70s this area has had the largest breeding colony of greater flamingos in France, and an artificial island has been placed in one of the lagoons to ensure there is adequate space for them to nest! 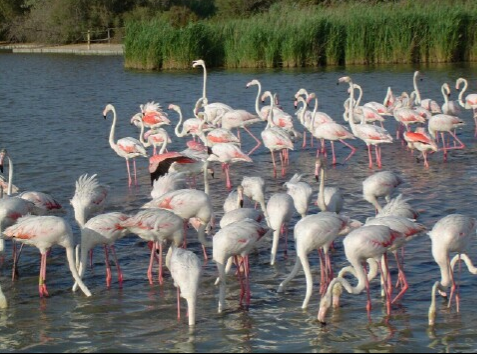 The ones that we could see were all quite brightly pink, but we later read that their colouring doesn't develop until their 5th year - and then some of them keep it for up to another 45 ! From there our ride took us along part of a 25 mile long sea dyke - Digue a la mer - this was built at the end of the 19th century to prevent sea water intrusions onto farmland. However, at intervals there are sluice gates so that water exchanges between the sea and the lagoons can be managed - and towards the end of our ride it was at one of these that we saw fish leaping - a bit like salmon do in Scotland when they swim upstream to return to their spawning grounds! Spot the Fish - The little big buggers were quite hard to catch - either with a net or on camera! The sluice had been opened and the gushing water had washed a large number of huge fish trough into the lagoon but they were jumping several feet into the air whist swimming against the current to get back into the ocean! You really wouldn't have needed many chips if you'd got one of them on your plate! Our ride also took us to a massive beach were there were literally hundreds of kite surfers - it was the biggest wonder that they didn't get their lines crossed! And while we were riding we saw riders of a different kind mounted on some of the area's historically famous white horses! 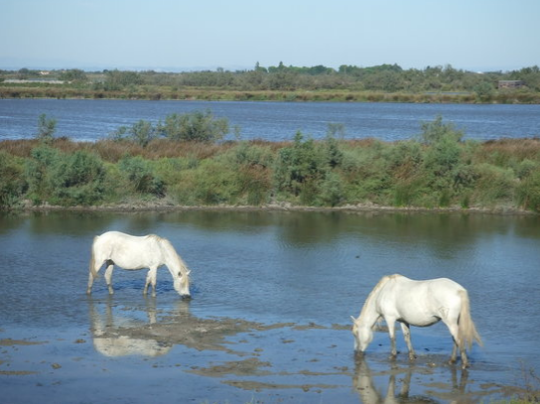 We later learnt that the Camargue's horses are a special breed and reputedly one of the oldest breeds of horse in the world. Some of those that we saw roaming were maybe semi wild, but we also saw quite a few sad ones providing plodding transport for tourists, or saddled up and waiting about for someone to require their services. On Monday we took a different route but this proved to be slightly less entertaining. 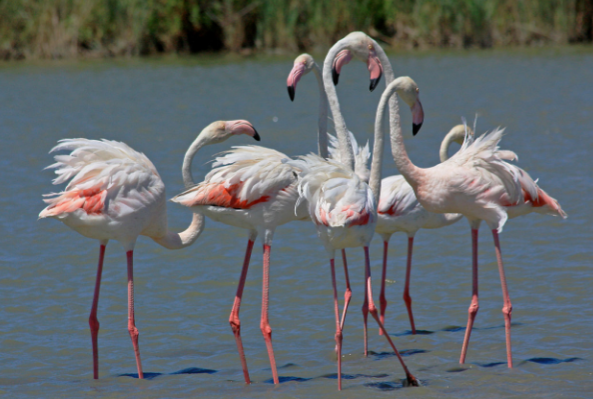 We still saw lots of bird life which included more flamingos, egrets, herons and even some raptors flying over the agricultural fields, but many of the lagoons that we passed were just dried sand beds that stretched for several miles. However, in places they looked quite pretty because they had salt drying on their surfaces which glistened and sparkled with iridescent colours in the bright sunshine. And it was while we were out today that we were treated to our first sight of the regions famous black bulls, who were grazing near some of this area's miles of paddy fields where rice has been produced since the Middle Ages. Over the two days we covered nearly 60 miles of roads and trails so I think it's safe to say we've explored the Camargue quite thoroughly - and as an extra bonus - it's completely flat so a vast change from our recent cycling expeditions of this tour! A scene that made us smile 😸! 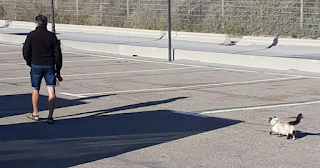 On Tuesday morning we started the homeward leg of our journey as we left the sparkling Med and commenced our trek back towards Calais - but we've got 3 weeks to do it in so we weren't in any rush! And we'd also got a bit of mission - you might remember that in my previous blog I told you about our resident gremlin who seems to have interfered with the pump that supplies diesel to our water and central heating system - well today we tried to get it fixed by calling in at a Motorhome Truma dealership that only required a short detour around Nimes as we travelled to our next destination! However, they spoke on English and we have very little French, but our mention of 'diesel' resulted in much arm waving and lots of 'no, no, nos' so we thought the message was that they couldn't help! 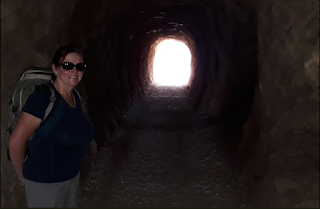 Our first view of the ancient aqueduct was quite breathtaking - it's over 2,000 years old and was constructed, mostly by slaves, around 50 AD - some of the blocks are estimated to weigh over 6 tons so goodness knows how they hoisted them up there. Today only 34 of the arches on the top deck remain, but originally there were 12 more - apparently in the Middle Ages stone was taken from it and reused in other buildings! It stands 160 feet tall making it the highest bridge that the Roman's ever built, and it's function was to carry water from the spring - The Source d'Eure - to the town of Nimes (31 miles away) and this continued until the 6th century (about 500 years). On Wednesday we concentrated on exploring the area and the bridge more thoroughly, and although we really enjoyed doing so, it did turn out to be a bit of a day of dead ends! First we crossed over the bridge and wandered down the right side of the river - only to be turned back after about a mile by a sign that indicated we were entering private land! So we tried the left side with a similar result! However, we weren't giving up! Our walk continued with a climb up a rough path that took us to the top tier of the bridge and provided views of the aqueduct itself and also of the tunnels and channels through which the water would have passed earlier in it's journey! Then once we'd explored that area we descended back down to the river side for coffee, and then crossed the bridge to the right side again so we could investigate a garden area that depicts the history of man's impact in this region. And it was after this that we discovered a strange phenomenon - if you enter the Pont du Gard Site from the left bank of the River Droite (which is the side our campsite lies on) it's free and you can explore to your hearts content - the only things you don't get are an audio guide and a tour of the museum. 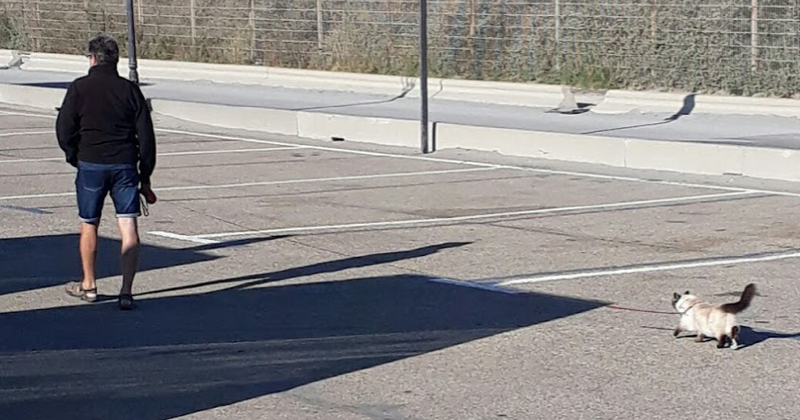 However if you enter from the Right bank in the car park area it appears that there is a charge of 15 euros each - and we very nearly fell foul of this! We left the garden area by a different exit to the one where we'd entered so now our path was heading for the ticket kiosks! There, we either had the choice of paying to get back over the river or of retracing our steps back the way we'd come to the free side - I bet you can guess what we did! And finally Thursday saw us taking it easy - well that was after we'd done 2 weeks washing, cleaned the van and the bikes and also completed a bit of route planning for our onward journey!